Philadelphia, Pennsylvania (January 15, 2018) – The Pennsylvania Auto Theft Prevention Authority (ATPA) today launched the #NoPuffers public awareness campaign in the greater Philadelphia area. Pennsylvanians who participate in the campaign could win $50. The campaign’s goal is to remind drivers not to leave their car puffing (running, unlocked, and unattended) in these cold temperatures or any time of year. 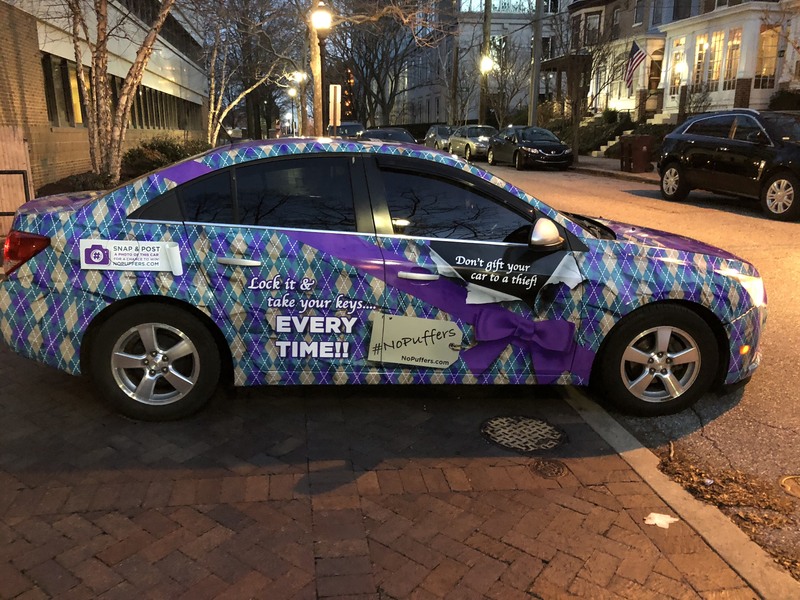 As part of the campaign, 11 cars will be wrapped to look like gifts and driven around the greater Philadelphia area from January 15 through September 15. The message on cars is, “Don’t gift your car to a thief. Lock your car, take your keys, every time.” Someone who sees one of these cars could win $50 by participating in the No Puffers Sweepstakes. Spot one of these wrapped #NoPuffers vehicles, snap a photo of it, and post to our entry page, Facebook, or Twitter and you could be eligible to win $50. One winner will be chosen every month. The official sweepstakes rules and more information are available at www.nopuffers.com. Lock the car, take the keys, every time. For most drivers, it’s a habit to either leave the keys in the car or to take them with you. Develop good habits — consciously make the decision to double check that you have your keys as you walk away from the vehicle. No place is safe from theft, even your own driveway. No puffing: Do not leave your car unlocked, running and unattended. Whether you’re just running out to grab a cup of coffee or warming the car up before leaving for work, it only takes a thief seconds to steal your car and ruin your week. It is illegal to leave a car running and unattended on a public road in Pennsylvania. Some municipalities also have laws against puffing on private property. Don’t leave valuables in your car. Leaving cell phones, mail, garage door openers, wallets, computers, or other valuables in the car attracts thieves. Leaving mail and sensitive information in your car also leaves you vulnerable to identity theft. Leaving keys and garage door openers can also invite burglary to your home. Created in 1994 by the state General Assembly, the Pennsylvania Auto Theft Prevention Authority combats auto theft by providing grants to law enforcement agencies, conducting public education initiatives, and providing specialized training. During the past decade, the rate of auto theft in Pennsylvania has declined 52% (and at a faster rate of decline than the national average).